13X Molecular Sieve is the sodium form of the type X crystal and has a much larger pore opening than the type A crystals. 13X Molecular Sieve is the sodium form of the type X crystal and has a much larger pore opening than the type A crystals. 13X Molecular Sieve will adsorb molecules with a kinetic diameter of less than 9 Angstrom (0.9 nm) and exclude those larger. 13X Molecular sieve also has the highest theoretical capacity of the common adsorbents and very good mass transfer rates. It can remove impurities too large to fit into a type A crystal and is commonly used to separate nitrogen from oxygen. Removal of CO2 and moisture from air (air pre-purification) and other gases. Separation of enriched oxygen from air. Removal of mercaptans and hydrogen sulphide from natural gas. Catalyst protection, removal of oxygenates from hydrocarbons (olefin streams). Removal of n-chained compositions from aromatics. Production of bulk oxygen in PSA units . 13X Molecular sieve can be regenerated by either heating in the case of thermal swing processes; or by lowering the pressure in the case of pressure swing processes. 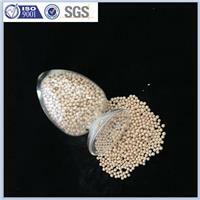 To remove moisture from a 13X molecular sieve, a temperature of 250-300°C is required. A properly regenerated molecular sieve can give moisture dew points below -100°C, or mercaptan or CO2 levels below 2 ppmv. 13X Molecular Sieve are available in beads of 1-2 mm, (10x18 mesh) 2-3 mm, (8x12 mesh) , 2.5-5 mm, (4x8 mesh) and as powder, and in pellet 1.6”, 3.2”.